In 2014, 46 Indian nurses were rescued from an ISIS controlled region of Iraq. 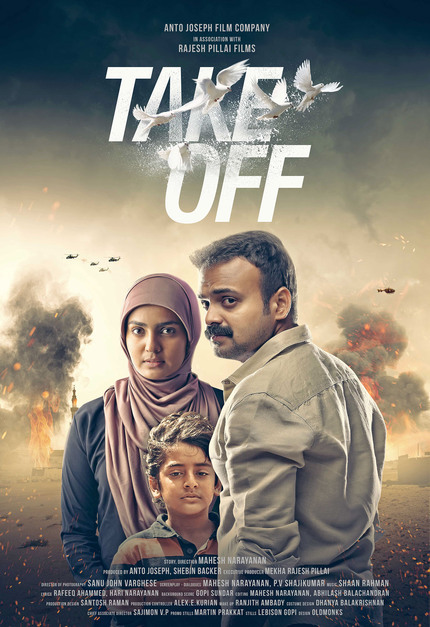 Director Mahesh Narayan's 2017 feature, Take Off, is based on their story, and it became one of the biggest commerical and critical successes of last year in its native Kerala. The film finds new life at the Indian Film Festival of Los Angeles where it was selected to play last week and it's a fine example of what mainstream Indian cinema can be when it decides that content is more important than album sales. Sameera (Parvathy) is a nurse in Kerala who has taken a job as a nurse in war-torn Iraq as a way to make some extra money for her and her son. Her marriage has dissolved and she needs to find a way to support herself. A relationship with a fellow medical professional Shaheed (Kunchacko Boban) makes the transition only more complicated as she now has to somehow explain her predicament to her 11-year-old son who has been staying with his father, who doesn't approve of the divorce. The new couple travel to Allied controlled Iraq with the mission of working for the friendly forces in areas where there is a shortage of medical staff. Soon their seemingly benign mission gets complicated when Shaheed is sent off to a dangerous region and is quickly, along with his colleagues, snapped up by ISIS terrorists and held hostage. Sameera gives chase and ends up trapped in a different area of the city with a crew of nurses also held by the terrorists. The film follows her journey as she attempts not only to get to and save her husband, but also becomes the instrument by which all of the nurses find their way home to India. The true story behind the nurses' rescue is largely confidential, due to the fact that a lot of it had to do with dodgy negotiations and clandestine military operations, but this imaginging of the circumstances is pretty believable, due in no small part to a trip of strong performances from Parvathy, Boban, and a third character who plays the Indian Ambassador in Iraq, the always reliable Fahadh Faasil. Take Off may take narrative liberties with a story that probably can't be completely told at the present time, but its handling of the story - even when it turns to a melodramatic romance - is wonderfully rich and organically engaging. Parvathy is one hell of a central performer in a film filled with strong actors, she holds the story together with every scene she's in. While her co-stars appear to be at the mercy of the story, she guides it - and this will sound sappy - through the power of her love for her husband and her family. It's a remarkable performance that deserves notice. The fact that Take Off is Mahesh Narayan's debut feature after a long and prolific career as an editor, is astonishing. He holds back the urge to get flashy with the storytelling and rather than focusing on the circumstances of the events - an urge that Bollywood action fest Tiger Zinda Hai, based on the same events, failed to overcome - Narayan focuses on their characters, taking drama from their journeys. It's a great film, which will certainly serve as a calling card for Narayan in the future as one of the big names from Indian regional cinema to look out for.